We are in a national weight crisis. Big Food's answer is to sell you smaller portions. But research points to less-is-not-more in terms of achieving sustained weight loss. We get hungry when we eat less food. Hunger is not sustainable because our bodies are built to satisfy hunger. That is why denial-based dieting fails. The fallacy that eating less will promote weight loss is at the heart of the Big Food industry’s marketing strategy. Examples of their new wave of “eat/drink less” products include 8-ounce Coke cans, McDonald’s testing a Big Mac Jr. and those sinfully wonderful “thin” Oreos. Big Food is embracing eating less because they know our bodies better than we do. Not unlike tobacco companies knowing that nicotine was addictive, Big Food knows that if they can keep us eating their food, then we will continue to make their products the central part of our diet. While they say helping customers maintain a healthy weight is one of their central focuses, what they really want is to sell more. If that was sustainable, then all of us would be fashion-model thin. Smaller portion size does not mean you will eat less. Do a test. Try watching TV and eating those “thin” Oreos. After you see how many you have eaten, you will understand that smaller portion sizes do not translate into eating less! Big Food is addicting. We continue to eat Big Macs, fries and soda even when we know they cause weight gain. We do so because these foods are filled with addictive chemicals including sugar (or artificial sweeteners), fats, salt and preservatives. Sustained weight loss is achieved by approaching Big Food as an addiction. The first step is admitting you are addicted. You do not kick an addiction by taking less of the addicting substance. The path to sustained weight loss is to admit an addiction to Big Food and to stop eating/drinking their products. Eating smaller proportions of Big Food is like cutting down to a pack a day of cigarettes. Eating less food is not sustainable. Eating less food will make you hungry. For most of us, eating less will boomerang us back into binge-eating Big Food to satisfy our hunger. Do not confuse eating a smaller hamburger or soft drink with shrinking your stomach size. Smaller stomachs can reduce the feeling of being hungry. Eating a smaller Big Mac will just make you hungry sooner for another Big Mac. Eating less is not the same as cheating. "Cheating" is part of many diets, including my own, featured in my new book "The Boomer Generation Diet." Cheating means consuming fattening foods in moderation or drinks that have honest ingredients. Cheating is fun. It reduces stress. Reducing stress reduces weight. Cheating is a key best practice in my losing 30 pounds. Eating Big Food is not cheating. It is just fattening. Stop buying Big Food. Big Food’s current efforts are focused on taking harmful things out of their products. They issue national press releases proudly announcing the removal of artificial colors or that they are reducing the amount of sugar in their products. Good for them. But it's still not good enough for achieving sustained weight loss. A major weight loss step is to stop eating Big Food. Stop going to grocery stores. Wow, that appears extreme. But here is why avoiding grocery stores enables sustained weight loss. These stores are designed around impulse or “feel good” marketing. We are preconditioned through mass advertising to impulsively respond to a grocery superstore’s huge displays of sodas, potato chips and cookies. Sure, we are smarter now. We do try to buy more fresh produce. But it is almost impossible to not walk out with at least one Big Food product. The ultimate solution is to avoid grocery stores. Shop at stores and markets that sell good-for-you food. That way, when you get the munchies you will not reach for the chips you knew you should not have bought but you did because that super-sized bag was on sale and you were impulsively attracted to the remembered taste of salt. We have all done it. But we all have to stop shopping at grocery stores to achieve sustained weight loss. Figure out what is good-for-you food that you like to eat. I love my diet. I eat food that tastes good to me. Because the food is good for me, I eat all I want. No hunger! 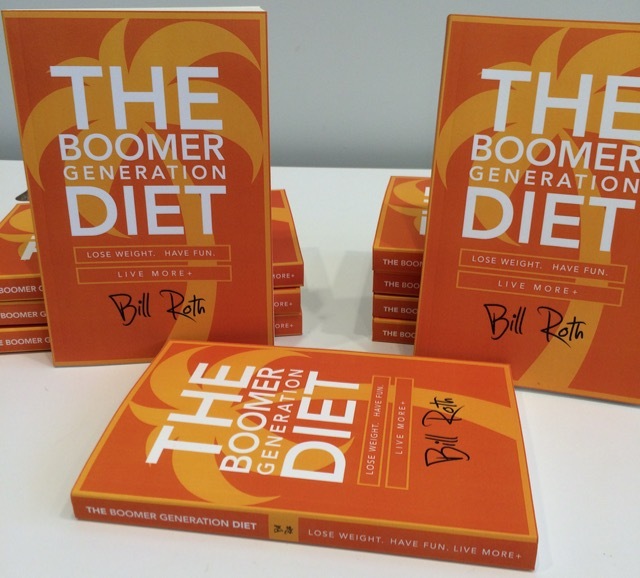 Most of what I eat I did not eat before figuring out "The Boomer Generation Diet." I built my diet by going online and finding foods that research said was good for me. Then I tried eating them. Most I didn’t like to eat. But there were enough of them that did taste good where I could build a daily diet. I still add and subtract as I test new foods. I enjoy eating … a lot! Dieting is not a sacrifice. It is fun and satisfying. The second of this two-part article shares weight loss secrets from I Love Lucy!